Whether you’ve decided to get fit to help lose a few pounds or just want to get healthy, you’ve taken the first step by deciding to do something about it. Yay – Well Done! But if you are a dog owner, like me, then fitting in gym sessions on top of our dog walks can feel impossible when life is already so busy. So wouldn’t it be amazing if there were lots of activities where you could get fit with your dog? The great news is that there is and many of these sports have grown in popularity over the past few years. And yes, there is more than just the option to run or walk with them! Here are our 9 New Year resolutions to make with your dog. Enjoy! You may be thinking.. woah! I already do that! But how often do you currently walk your dog? Do you know the distance and the pace that you walk at? Walking is a fantastic place to start when increasing your exercise. You want to start simple and set a target for a set number of steps per day. Wearing a pedometer or using one of the smartwatches will help up your exercise and I found that setting a small target with extra long walks at the weekend help me beat some of those January blues too! Estimated Cost to get started – zero! Make sure you wrap up warm on those winter days and have some decent walking shoes, boots or trainers. Most smartphones have health apps where you can track your steps too. Millie’s Verdict – I love sniffing new places and getting out for extra long walks. There is something about heading out on a Sunday for a few hours somewhere new. Mum loves this book “Angus and Dundee: 40 Coast and Country Walks” and you can also jump into the Dog-Friendly Angus Facebook Group HERE for lots of ideas too. You can’t look at a health blog with ideas of low-cost exercise without running being high on their suggested list. If you are restricted to road running then you’ll need to get comfortable with running with your dog on lead or progress to Canicross below which will help avoid any lead mishaps! If you have an energetic dog like Millie, there is a high likelihood they may get bored or spot something and swerve off the trail. So do be prepared! Why not set yourself a target by registering for a race during 2019. Or perhaps join your local Park Run? You’ll find most Park Runs allow dogs though ask for them to be on a lead or the shorter 3m Canicross bungee. Estimated Cost to get started – a good pair of running shoes and possible some warmer winter layers and you are set. You may also want to consider a waist lead or specific lead for running with your dog. Millie’s Verdict – did someone say run? Let’s go! I prefer off the lead and treat it like a game. Mum’s chasing me and she can’t catch. Ha ha!! “Cani what? ?” I know, I’d never heard of it either until the end of 2015. I was lucky enough to find a ‘couch 2 5k’ class where I lived at the time near Surrey. If you already do some running, then this would be a great way to increase your distance, learn how to run safer with your dog and meet new friends too. I’d strongly recommend getting to know if there is a club around you as it’s a fab social activity. I know Millie ‘pulled’ better when out with other dogs and it also helped her understand what was expected, after years of training not to pull on a lead. The great news is that there is a local club – Dundee and Angus Canicross who do regular meetups and attend races. They seem more than friendly so I’m looking forward to popping along to one of their sessions later this year. I’d also suggest checking out Quick Brown Dog who can give you fab advice on harnesses and lines too. You can read about my first time out Canicrossing with Millie and the 5 reasons why you should try it in a previous blog – HERE. Estimated Cost to get started – assuming you already have some running kit then zero! Most clubs allow you to borrow the dogs kit while you try it out but as you’ll be running offroad, I’d suggest buying a good pair of trail shoes. If you decide to continue, you’ll then find you spend between £30 to £100 for basic kit (harness and bungee line). 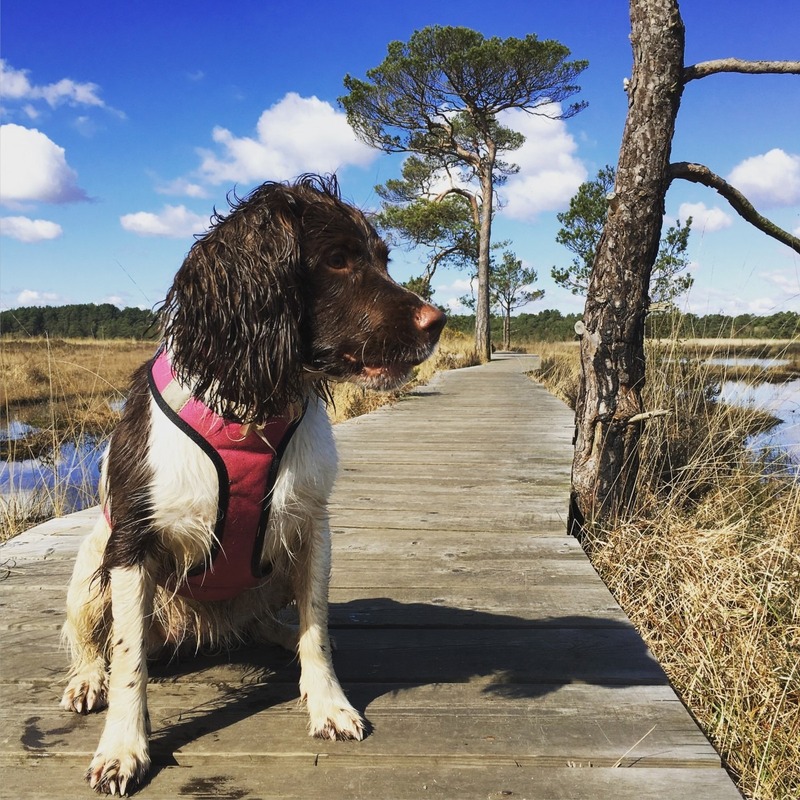 Millie’s Verdict – I hate a harness. Even if it is in my favourite colour pink. But when I see all my friends arrive for a run, then I’m off. The fab news is that we tend to head out to places where I can have a dip in a lake and run off lead in-between our run sections. I also get one very big treat after a long run before a huge snooze. Mum says it can look like I’m running in my sleep. I don’t believe her. I’m way too cool for that. Bikejoring is riding a bike with dogs pulling you, though you could use a scooter instead of a bike. Sounds a little bit scary but looks amazing and it’s clear that dogs love it! I’ve found this great youtube video which shows you the basic equipment that you’ll need, as well as bikejoring itself. You’ll need a good mountain bike (bikejoring is done off road) and all the basic mountain biking basics including a bike crash helmet! 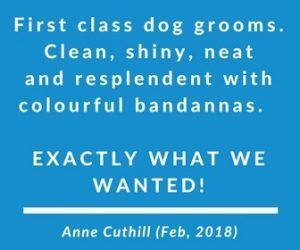 Estimated Cost to get started – along with your mountain bike and kit for you, you’ll need a bikejor ‘arm’ for your bike along with a harness and bungee line for your dog too (just like Canicross above). Approx £60 to £140 excluding mountain bike and personal kit. Millie’s Verdict – me, running alongside a bike. I don’t think so. But then again I’m a little anxious around bikes. Mum says we’re going to be brave and give it a go. I’m wondering if she’s going to get a pink bike to match my harness!?!?!? Wee and Poo stops. I need to make sure I understand when Millie has to go! and a lifejacket for her too! A popular and growing sport during 2016, so we finally took the plunge and gave this a go with Paddle Surf Scotland at Loch Clunie. You can see how we got on below! Estimated Cost to get started – you may be able to hire a paddleboard as part of a class and more SUP providers will now allow dogs too. Check out SUP2SUMMIT who are based in Montrose. Basic classes can start at around £30. Millie’s Verdict – Wait a minute. I get to potentially make mum fall over into the water and spend time out on the water. I’m not waiting for her too book, this is going to be great fun (though I know I’m not going to like that lifejacket!). Not all dogs love the water but, if they do, Kayaking may be a fab chance for you to get fit along with your dog. As with paddleboarding, you do need to consider whether Kayaking is suitable for your dog or what you could do to help them prepare and enjoy their time out too. Estimated Cost to get started – if you already have a suitable kayak and it will sustain the weight and size your own dog wait then yay! All you’ll need is a lifejacket which you can buy around £20 to £40 (for e.g. Ezydog Flotation Jacket ). Otherwise given a Kayak and transport can be expensive try searching for a local class to give it a try first. Circa £30 upwards. Millie’s Verdict – Did someone say water, again!!!! I LURVE WATER – Can I try, please? Though I’m not sure I’ll be able to stay in the Kayak. Way too much fun swimming. You may think dog agility is all about your dog but you’ll be surprised how much ground you will also cover in a class. As your dog improves and you start to focus on time, you’ll be speeding around that agility course too, trying to keep up! You’ll find most clubs offer a fun version of agility along with the more professional competition variety too. I took some time out at Discover Dogs to watch the competitive agility sessions. So impressive and so many different types of dogs and owners competing too. Don’t think it’s all about collies and spaniels, your dog may surprise you! Estimated Cost to get started – you can buy your own equipment starting from around £20 upwards with classes tending to start from £5 per session depending on locality. Millie’s Verdict – Looks easy, doesn’t it? Saunter around a course and I get lots of treats to encourage me. But no! I have to think lots, work out what I’m meant to do and I’m mentally exhausted by the end of it. I love the a-frame and tunnels though – I even hit the markers at the start and end which results in more treats! Mum gives me lots of my favourite liver treats when I start to look a little bored or tired too! #8 Heelwork to Music – Dancing! Do you remember Ashleigh and Pudsey from Britain’s Got Talent? I loved their winning routine, Mission Impossible, from the final of Britain’s Got Talent in 2012. Well, that routine was a form of heelwork to music or freestyle for those that like to keep true to the competition requirements and technical terms! Heelwork to Music is based on the sport of canine obediences and it uses the heelwork elements of that sport. Your dog will need to walk in one of 8 prescribed heelwork positions and the handler will choreograph that to a piece of music. You’ll need lots of patience but you’ll be surprised at how many steps you’ll rack up while training too! For those who are intrigued, Heelwork to Music is where a dog must be in a heelwork position for 65% of the routine, whereas in Freestyle they are only allowed to be at heel for up to 35% of the time. The rest of the routine is made up of a series of moves that demonstrate the music, either the wording, phrasing, rhythm or theme. I recently watched the Southern Golden Retriever Team at Discover Dogs dog show at Excel in London. I took this short clip so that you could see them in action. Estimated Cost to get started – you could do this at home with some music and choreograph your own routine. Though you may find it beneficial and fun to join a Heelwork to Music class from around £8 upwards. Millie’s Verdict – with the right music (and treats), I think I could be persuaded and expand my trick range. I like showing off after all. No silly outfits though mum. I’m a cool gundog remember! Now I know you may think I’ve gone a little mad but I promise you this is a ‘thing’!! Mahny Djahanguiri is the Doga Expert which like most dog activities, gained popularity in America before reaching the UK. In short, the idea behind Doga is for you and your dog to bond through a series of breathing and tantric exercises. Doga is all about nurturing the relationship with your dog, and both dog and owner relaxing. Millie’s Verdict – Hmm, I love a good stretch, int the morning before I start begging for a morning run BUT not sure how I’d feel if mum wanted to swap a walk for doga. Maybe I could be persuaded with a LOT of treats – just no videoing! 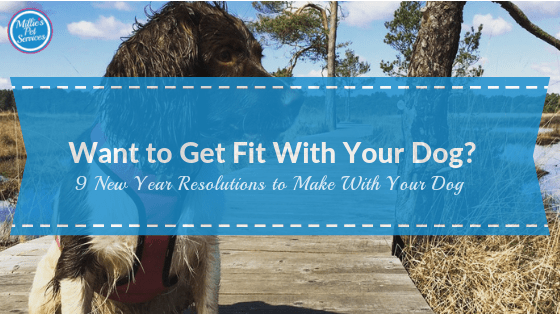 Still Looking for Ideas to Get Fit With Your Dog? If you haven’t yet spotted something that you’d enjoy in the above list, I’d recommend heading along to one of the several Country Show and Dog Shows that take place across the UK. You’ll find lots of demonstrations and other dog owners who can give you advice. 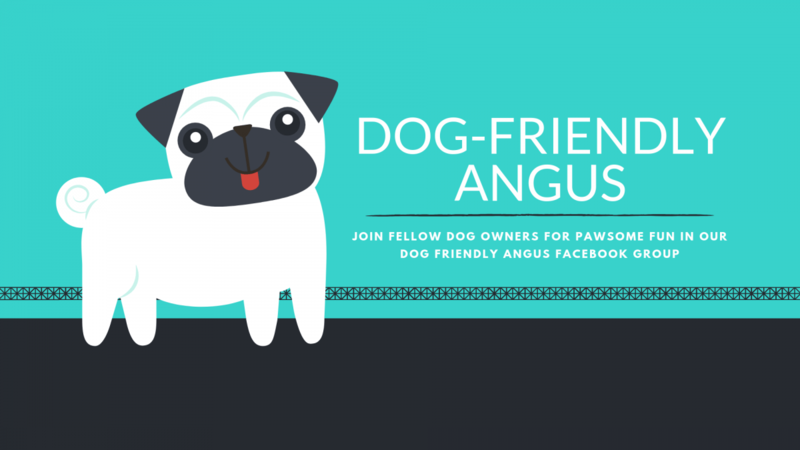 You might also want to join the Dog-Friendly Angus Facebook Group to ask for ideas or pop along to one of our monthly dog walks to chat to other owners. So – what will you try first? Have we missed any other ideas to get fit with your dog? Let us know in the comments!